Comments: Phenomenally fast and maneuverable, the TIE defender rivals even the legendary A-wing starfighter in its capacity for seemingly impossible twists and dives. Designed in response to the successes of the Rebellion’s fighter forces, it is a substantial departure from previous generations of TIE starfighters, incorporating heavier armor, deflector shields, a hyperdrive and far more powerful weapons systems. Unfortunately, it is also prohibitively expensive to manufacture, ensuring that it will never be produced in the same vast numbers as other Imperial fighter craft. 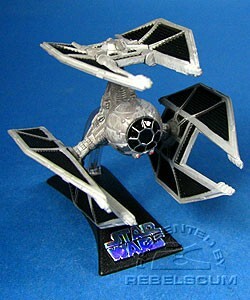 The TIE Defender is all-new. This also markes the first time a vehicle has an attached support rod.